Baked. Not Of The “Herb” Kind. If you’re not sure what you’re looking at right now, this is a box of deliciousness. A box filled with something can would satisfy the sweetest of sweet tooths. Well they’re not that sweet, but I think you get what I’m trying to get at. 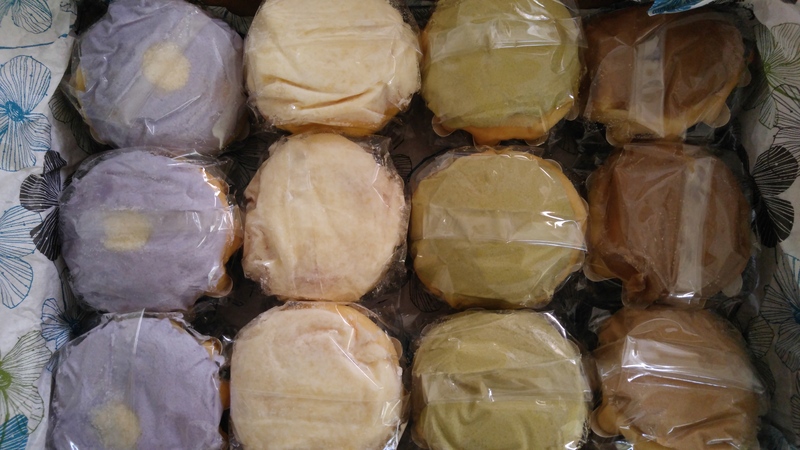 This is a dozen of a Filipino pastry called ensaymada. From left to right you have the flavors ube, original, green tea, and nutella. I bought these at a new pastry shop in Rancho Cucamonga called Baked Dessert Bar. They specialize in Filipino pastries and have their own, but these right here were provided by The Ensaymada Project. The Ensaymada Project provides not just Baked, but other cafes and bakeries with their ensaymada. I must say, I love these!!! They definitely put a very good twist on a classic. The classic usually is just like the original, seen above, but with shredded cheese on top, but now they come in all these different flavors. Ensaymada usually comes as something so soft and moist, these are no different, but do those new flavors change “the game.” My favorite out of the bunch in the picture is the green tea. I’m already a big fan of the green tea, but on the inside is red bean. Yes! Red bean on the inside, mixed with the green tea flavor on top, perfect combo. With that being said, my true favorite of all of them is not featured in the picture, but it is the banana flavor. I know what you’re thinking, “there’s a banana flavored ensaymada?” Yes there is and it’s so good! The flavor is definitely like banana cream pie, so if you like banana cream pie definitely need to try this one. Really though, you need to try ALL of them. Just go already. If you are in town (Rancho Cucamonga, CA) you I say it is a must. P.S. more pastry reviews from Baked Dessert Bar coming soon. Thanks!